The early portion of any hockey season can be a hectic time, and not always for the most obvious reasons. "You've got guys settling into new roles, new faces, players just getting to know their teammates and coaches," explained head coach John Stevens. "But there's also the non-hockey factors, taking care of family life. Some guys are new to the area, moving into new homes, getting the kids settled into new schools. "Basically, life doesn't stop just because hockey season starts. Part of the challenge is getting everyone on the same page." Which is the main reason Stevens is looking forward to a week of "team bonding" exercises in Florida this week. With a rare five-day break between games, the Flyers will leave for the Sunshine State on Monday, well in advance of Friday's meeting with the Florida Panthers (7:30 p.m., CSN-HD). The destination is Fort Lauderdale, where the players will participate in a fishing tournament and a regatta-style sailing race in the Atlantic, while also working in a few practices. "It's a break from the norm," said captain Mike Richards. "It's a great opportunity to get away from daily routines, have a little fun, and hopefully enjoy some bonding time. "That's important, especially with new guys on the team. You tend to learn a lot about your teammates on trips like this, even the guys you've been around for a few years. It's something positive and a little different." Due to the locale and choice of activities planned, this trip figures to provide a different experience than previous years' excursions to Whistler, British Columbia in 2007 and West Point Military Academy last year. While players will not be hiking through forests, rappelling down ziplines, or negotiating their ways through army-regulated obstacle courses, however, the objective remains the same. "This won't be all about fun in the sun," said Stevens. "We'll have a few surprises planned for the guys as well. The break in the schedule gives us the chance to try something different this year. It works, with the next game being [in Florida] on Friday. "The goal of these trips - when we say team bonding - really comes down to two things: teamwork and building trust. The better you know your teammates, the more you trust in them, and, in turn, earn their trust. And that's essential for success, in any walk of life." Forward Scott Hartnell, one of several players who joined the Flyers two seasons ago, recalled the Whistler trip, and the role it played in bringing the team together. At the time, he compared the process of getting to know his new teammates to building a large puzzle, piece by piece. "It's the same way now, even though the turnover on this year's team isn't as great," he said. "As one of the new guys, the Whistler trip was important in helping us establish a foundation. In a sense, we're all new to the team at the start of another season. "We learn as we go. 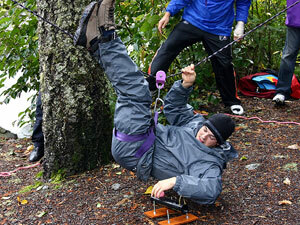 The exercises we went through up in Whistler and last year at West Point were constructive and served a purpose. Some were more fun to go through than others, but they allowed us to learn more about each other along the way." Defenseman Kimmo Timonen, who was acquired with Hartnell from the Nashville Predators, echoed his longtime teammates' sentiments, and offered additional perspective on being the "new guy." "One of the interesting things about these team bonding trips is that everyone is on the same level," he noted. "It doesn't matter if you're a veteran or a rookie, because no one really knows what to expect. "So, in a situation where we are doing a problem solving exercise, a younger player might not feel funny about speaking up and taking a leadership role. We have some young guys on the team who we have high expectations for, and it's good for them to be in that situation." As the team prepares to head down south, Stevens is looking forward to the change of pace the trip will be sure to provide, while still remaining focused on what the team has to work on, moving forward. "I'm pleased with the way things have gone over the first five games, for the most part," he said. "Sure, there are things we have to address and work through, as there always are. We won't be ignoring those things, the hockey things, on this trip. "But, it does offer the chance to expand our horizons a bit. We could spend the week in Philly, but we feel there's an opportunity to bring the team together in a different way, as we have in the past. This is an important trip, and we're all looking forward to it."